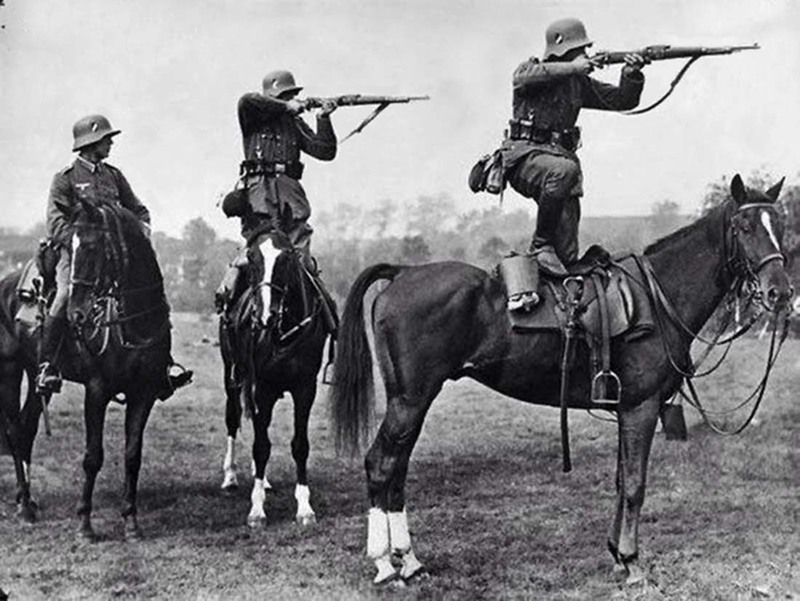 German soldiers take aim from the backs of horses, 1935. German cavalry firing from the standing saddle position during maneuvers on the Karshorter Racecourse, Berlin. 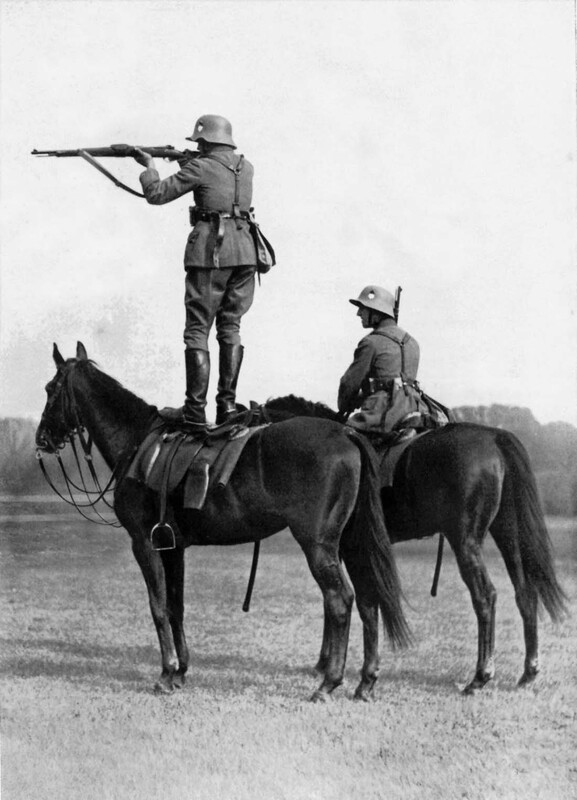 The cavalry was trained to “fire from the saddle” in this way at that time. It is very doubtful whether this method featured much, once the action started. It did nothing to reduce the vulnerability of the horsemen to counter-fire from opposing infantry and machine-gunners; indeed, it increased such vulnerability. World War 2 was end of massive cavalry use. Based on Wehrmacht eagle on uniform, it’s clearly Wehrmacht cavalry. The helmet looks like an M17 or it could be a M16. The horses were trained just like Pavlov trained his dogs: making them used to loud bangs and the sight of rifles and such, by repeating these things over and over, so they wouldn’t panic when confronted with them on the battlefield. The term for this kind of training is “bomb-proofing”. Horses in World War II were used by the belligerent nations for transportation of troops, artillery, materials, and, to a lesser extent, in mobile cavalry troops. The role of horses for each nation depended on its military strategy and state of economy and was most pronounced in German and Soviet ground forces. Over the course of the war Nazi Germany and the Soviet Union employed more than six million horses. Infantry and horse-drawn artillery formed the bulk of the German Army throughout the war; only one-fifth of the Army belonged to mobile panzer and mechanized divisions. Each German infantry division employed thousands of horses and thousands of men taking care of them. Despite losses of horses to enemy action, exposure and disease, Germany maintained a steady supply of work and saddle horses until 1945. The German Army entered World War II with 514,000 horses, and over the course of the war employed, in total, 2.75 million horses and mules; the average number of horses in the Army reached 1.1 million. These soldiers might not have been firing from this position as their rifles all still have the leather rear sight covers attached. Perhaps they are using iron sights, maybe even training, as the third one is just am sitting and observing?